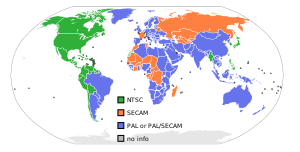 Below countries and territories currently use or once used the PAL system. Many of these have converted or are currently converting PAL to DVB-T, DVB-T2, DTMB (China) or ISDB (part of South America). บราซิล (simulcast with digital format in ISDB-Tb, also called SBTVD), an update to ISDB-T, started in December 2007. PAL broadcasting continues until 2018. ↑ 1.00 1.01 1.02 1.03 1.04 1.05 1.06 1.07 1.08 1.09 1.10 1.11 1.12 1.13 1.14 1.15 1.16 1.17 1.18 1.19 1.20 1.21 1.22 1.23 1.24 1.25 1.26 1.27 1.28 1.29 1.30 1.31 1.32 1.33 1.34 1.35 1.36 1.37 1.38 1.39 1.40 1.41 1.42 1.43 1.44 1.45 1.46 1.47 1.48 1.49 1.50 1.51 1.52 1.53 1.54 1.55 1.56 1.57 Michael Hegarty; Anne Phelan; Lisa Kilbride (1 January 1998). Classrooms for Distance Teaching and Learning: A Blueprint. Leuven University Press. pp. 260–. ISBN 978-90-6186-867-5. หน้านี้แก้ไขล่าสุดเมื่อวันที่ 18 มกราคม 2562 เวลา 07:49 น.